Networks today are exponentially faster, bigger and more complex than those of just a few years ago. With thousands of devices going online for the first time each minute, and the data influx continuing unabated, it’s fair to say that we’re in the throes of an always-on culture. As the network becomes arguably the most valuable asset of the 21st century business, IT departments will be looked at to provide not just operational functions, but, more importantly, strategic value. Today’s network infrastructures contain hundreds of key business devices across a complex array of data centers, virtualized environments and services. This means Performance and Security Specialists are demanding far more visibility from their monitoring systems than they did only a few years ago. The growing complexity of modern IT infrastructure is the major challenge faced by existing network monitoring (NMS) and security tools. Expanding networks, dynamic enterprise boundaries, network virtualization, new applications and processes, growing compliance and regulatory mandates along with rising levels of sophistication in cyber-crime, malware and data breaches, are some of the major factors necessitating more granular and robust monitoring solutions. Insight-based and data-driven monitoring systems must provide the deep visibility and early warning detection needed by Network Operations Centre (NOC) teams and Security professionals to manage networks today and to keep the organization safe. 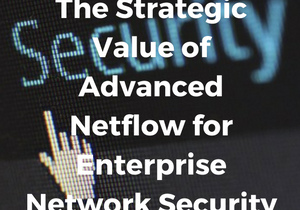 For over two decades now, NetFlow has been a trusted technology which provides the data needed to enable the performance management of medium to large environments. Over the years, NetFlow analysis technology has evolved alongside the networks it helps optimize to provide information-rich analyses, detailed reporting and data-driven network management insights to IT departments. From traffic accounting, to performance management and security forensics, NetFlow brings together both high-level and detailed insights by aggregating network data and exporting it to a flow collector for analysis. Using a push-model makes NetFlow less resource-intensive than other proprietary solutions as it places very little demand on network devices for the collection and analysis of data. NetFlow gives NOCs the information they need for pervasive deep network visibility and flexible analytics, which substantially reduces management complexity. Performance and Security Specialists enjoy unmatched flexibility and scalability in their endeavors to keep systems safe, secure, reliable and performing at their peak. Although the NetFlow protocol promises a great deal of detail that could be leveraged to the benefit of the NOC and Security teams, many NetFlow solutions to date have failed to provide the contextual depth and flexibility required to keep up with the evolving network and related systems. Many flow solutions simply cannot scale to archive the necessary amount of granular network traffic needed to gain the visibility required today. Due to the limited amount of usable data they can physically retain, these flow solutions are used for only basic performance traffic analysis or top talker detection and cannot physically scale to report on needed analytics making them only marginally more useful than an SNMP/RMON solution. The newest generation of NetFlow tools must combine the granular capability of a real-time forensics engine with long-term capacity planning and data mining abilities. Modern NetFlow applications should also be able to process the ever expanding vendor specific flexible NetFlow templates which can provide unique data points not found in any other technology. Lastly, the system needs to offer machine-learning intelligent analysis which can detect and alert on security events happening in the network before the threat gets to the point that a human would notice what has happened. When all of the above capabilities are available and put into production, a NetFlow system become an irreplaceable application in an IT department’s performance and security toolbox.